Suri & Katie headed to Target in Bourke St, snapping up about $800 worth of toys, clothes and homeware to make her gilded living quarters at Crown more homely. 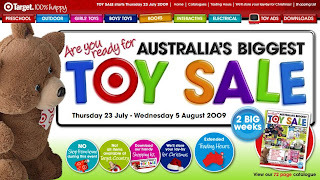 Suri & Katie, accompanied by two security guards, browsed the store before buying among other things a children's bike, a Dora the Explorer piano, a Barbie doll, some flannelette sheets for a child's bed, several floor mats with heart and flower designs, some board games, several children's DVDs and an AFL football. Before popping down to Target, Holmes spent time in the day Spa at Crown. Katie and Suri spent some time relaxing by the pool of their hotel, milling about with the other hotel guests. According to hotel guests and reports, Katie wore a green paisley one-piece swimsuit while Suri played in the indoor pool by holding on to a blue pool noodle.